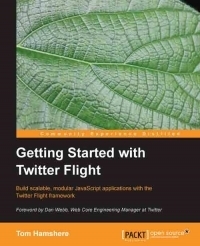 It's not a typical JS web programming library book, but Twitter Flight isn't a typical JS library either. When I've started reading it, I was pretty sure it won't get more than 1 star in the final rating: until 33% of the book, there was no code sample! Yes, as ridiculous as it sounds (for a web programming book). Author has decided to start with describing how awesome and useful the library is, without any direct proof - yikes! Fortunately, it gets much better later on. Author's description of Flight is using one simple ToDo-style application as a playground -> it works quite well, because the problems author's facing are RL ones and reader doesn't have any problem with applying those to her/his work, but unfortunately Hamshere doesn't dive into more advances scenarios. That can leave readers who don't have much experience with event-based systems a bit hopeless. Anyway, if you're looking for an introduction to Twitter Flight, this book make sense. Sign into Goodreads to see if any of your friends have read Getting Started with Twitter Flight.